So this is my first writing in this thing we call blogspot. I do have a lot of other writing sites where i always put my minds into the form of alphabet characters, but maybe this is just another approach from me to actualy widen the perspective of which this little sparrow has. But whatever, i am a writer and i will always write and write and write. Well, so far there is a lot of people who actually read my writings and they do like it, but there is also a portion of people who hate it in any way. It's life, you know? Sometimes you cannot just satisfy everybody in your life circle. It is just that. So, what is it about life that this man wants to talk about? Nothing much actually, only one thing: i want to make people become more aware and significantly ready in order to approach everyday life. Call me a demotivator, call me a liar, call me anything you want. But for sure, this life is nothing similar like the lives of the kings and queens we often read from nursery books or bedtime stories. Not that im crushing the dreams of the younglings, but it's just that for me, life offers me a lot of ridiculous experiences in which i failed to counter. And i believe so are you. But anyway, let me start with my own life. So who is this Mighty Jacksparrow? Sounds pathetic, I know, but i just like the name. At 21 years old, i consider myself as a young man even though many claims that i actually act like a 30 years old man. But whatever, maybe my life was so tough it actually turned me into a rusting blade. Oh yes, my dear, i haveth lived a hard yet so challenging life that there were many times before i just wanted to quit the game for once and for all. SO hard, life was so hard back then. Even now too. A man like me is treated differently for being different than others, I am one of the minorities who receive sceptical looks from people who think they are more superior by having tons of complex humans around them. People who think they are smart enough by having lots of friends who end up being useless to them. Yes, i might have friends that i can count using my own fingers and toes, but these friends whom i keep for life are the best among everyone else. They are the people who stick with me no matter what. The friends that i have are the ones whom i trust and i care all along, together with their respects and brothership. Probably some of few who know me by my full name. It's kinda funny to hear how some people ended up creating stories about me. They looked at me, make simple (when i say simple, i refer to infant level thinking ability, which is idiocy) judgement and start to create turbulence in my life. They talk about what i wear, about the car i drive, the way i talk, the way i behave and what i do everyday. As if I am a rock star or something, you know. I dont really get it why, but it's not those criterias that matter most; except me as a human being. That is why when i say, "He is my friend," I mean it, since that a friend have nothing towards you; not the clothes, the car, the perfume, not even everything. But as always, there comes a time when you were let to lead the way all alone by yourself. There will be a time when everyone leaves you alone in the dark, to find your own way home. There will be no friends, no allies, no one else but yourself whom you have to trust and believe all along the way. Or you can always be pushed down without showing any fight. I have gone through a lot of things. Things which you cant even imagine how they were like with your academic mind. Things which can provoke you to kill yourself every single time they strike your life (well the frequency is like everyday to me). Things which will keep on pushing you down into the ground a few miles a day, showing you everything but mercy. Things that actually kill your mind first before the body. and i invite you to go along this life with me. 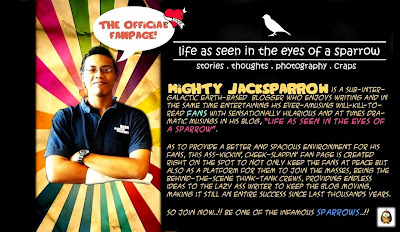 Welcome to the world of the Mighty Jacksparrow.